Writing a novel that celebrates the best and worst of food is pretty easy, just figure out the foods you love and hate the most, then go at it. Okay, maybe that simplifies things a bit, but not all that much, really. My novel BIG MOUTH is filled with my food likes and dislikes, with Shermie voicing my personal menu word-for-word. In the candy department, my list of lifelong favorite candies includes Haribo Gold-Bear gummi bears, just like Shermie. I’m telling you, when it comes to gummies, Haribo makes the yummiest, hands down. I got hooked on Haribo Gold-Bears as a little kid, maybe three or four years old, when my family lived on McGuire Air Force Base in New Jersey, a major hub for aviators “importing” foreign delectables. I think the base commissary stocked Haribo Gold-Bears long before the Haribo company decided to officially distribute in the USA. At least, the general American population wasn’t yet in the know about this wonder candy. There are some definite perks to being an Air Force Brat. Given my obsession with Haribo Gold-Bears, it was no surprise to me when, while I was writing a scene that had 14-year-old Shermie Thuff talking about his favorite foods, Shermie suddenly announced that gummi bears were his favorite candy. Haribo Gold-Bears, to be precise. I practically high-fived the character then and there. Shermie was making things very easy for me; I could write about Haribo Gold-Bears forever…which is about how long I can chew one. Those things can be tough if you don’t get them right off the boat. Yet they’re sweet and perfect nonetheless. One thing that wasn’t so easy when I wrote this book was typing the word “gummi” as often as I had to after that scene. How would you spell it, “gummy” or “gummi”? The question drove me nuts. Hey, I am an editor in my spare time, I often obsess over things like this. Even as a kid, the hyphen in the name Haribo Gold-Bears bothered me. I didn’t understand why it was there. I still don’t. I suppose I could’ve done some kind of extensive search to justify it, starting with the Chicago Manual of Style, the bible of every copy editor, but I never really felt like it. But I did look into the spelling of “gummi” versus “gummy” and have determined that both variations are right. Although . . . the inventor was German, so the “gummi” spelling just feels better, don’t you think? Not that I had any say in the final spelling of it BIG MOUTH, the Random House copy editor was the boss of that. So it’s “gummy” in my book. As for the Japanese-sounding name “Haribo,” it’s an acronym for Hans Riegel Bonn, which is itself a combination of the candy maker Hans Riegel and his hometown Bonn, Germany. Hans invented the gummi bear in 1922 and it was an instant hit thanks to obsessed little kids like me. And that popularity has endured. 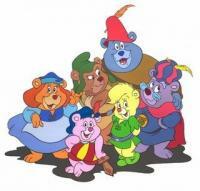 Sixty years after the bears were invented, Disney created a cartoon show, “The Adventures of the Gummi Bears,” about a family of gummi bears. It lasted 65 episodes. That show may be off the air now, but the candy is still going strong. How do they make gummi bears? What’s in a gummi bear? What are the flavors, anyway? (Tease: the green one is not what you’d expect.) For the surprising answers to those seemingly simple questions, I’ll send you to the “Fun Facts” page of the Big Mouth tribute site www.BigMouthTheBook.com, which has other gummi trivia, too. Suffice it to say here, if you’re in the cafeteria of the Jewish Museum Berlin and get a hankerin’ for gummi bears, you’re in luck…. *”Me and My Big Mouth…” is an occasional series about inspirations, backstories, and random stuff tucked into my teen novel BIG MOUTH. 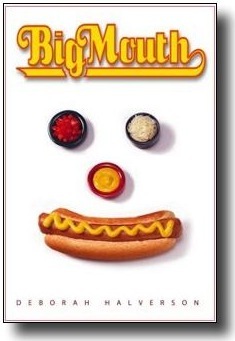 For more about BIG MOUTH, check out www.BigMouthTheBook.com. Debbie, I googled it and found out that they are Gluten free and Casein free so Tommy can eat them. he loves the gummy bear vitamins and I haven’t found (well haven’t dillegently looked) gummy candies for him. I’ll ck the base before I order them. The commissary has a german section and around the holidays they get all sorts of european sweets. Thanks for sharing, I’m sure my 3 will love them too!